Fender has introduced the world’s first electric guitar that is also an officially licensed Rock Band 3 video game controller. Blending state-of-the-art gaming and guitar technology with Fender design and engineering, the Squier by Fender Stratocaster Guitar and Controller is created for musicians and gamers alike and rocks whether plugged into a guitar amp or into a video game console. Designed for the Rock Band 3 Pro mode, the Squier by Fender Stratocaster Guitar and Controller elevates the gaming experience to the level of real music making by letting you play the actual notes and chords of your favorite songs while racking up high gameplay scores. Its position-sensing fingerboard responds to the touch, turning gameplay into real musical performances. 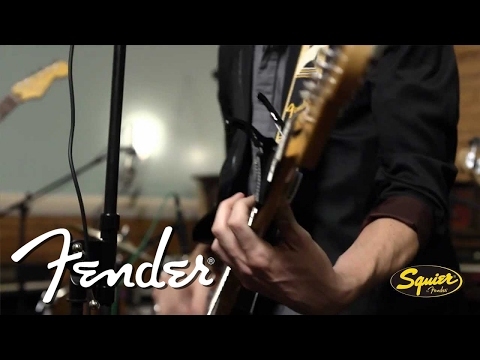 Fender has announced that a new, modified version of their Squier series of guitars will be released for Rock Band 3. This is a fully functioning, six string guitar compatible with the PS3, Xbox 360 and Wii, for Rock Band 3, and its new Pro Mode. The guitar, priced at USD$279.99 will still require a MIDI adapter–at additional cost–to plug into a respective console, and will be available March 1st 2011, with pre-orders being accepted as of January 1st 2011. The guitar, and Rock Band 3’s Pro Mode, are designed to take music gamers to the next step, if they’re willing, and finally learn how to play a real instrument.